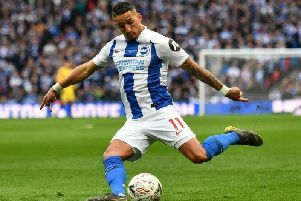 Albion led twice with goals from Anthony Knockaert and Glenn Murray but Steve Cook and Callum Wilson earned the Cherries a point in the Premier League clash. Reflecting on the match, Howe said: "I'm happy with how we came back and fought back but I'm disappointed with the goals we conceded today, not just the timing but the manner of them. "We really did shoot ourselves in the foot a little bit. When you come away from home and concede so early in both halves, it's difficult. "I'm very pleased with the response as it's not easy to chase the game in the way we did and with the quality we did. That was the impressive thing from today." On the Cherries penalty claims, Howe said: "There was a mixture. Potentially we could have got four penalties but the reality is maybe one probably was but I'll have to review them all to see." Brighton remain two points ahead of Bournemouth after the draw and on the Seagulls' start to life in the top flight, Howe said: "I think they've done very well and I said that before the game. "My comments were genuine, I think Chris has managed the club very well. They've done well in the transfer market, they look strong and they're picking up points which is not always easy to do in the Premier League. "Again today it was a really tight game between two teams that were really going for the win, so I think they'll be fine."